These large booklets aim to tell younger readers some of the facts about historical figures. Certain pages from this excellent resource may be photocopied for use as class or group material. Alongside the story, which includes several illustrations, there are also some great activities to have fun with. These include word-searches, puzzles to work out, games and activities to enjoy, things to find out. The story of C S Lewis starts in a comfortable home in Ireland. 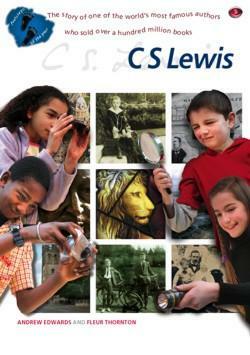 From these beginnings C S Lewis met with several tragedies in his life which helped him develop his thinking. Today he is remembered mostly for the books he wrote. He sold over a hundred million copies and his books have been translated into more than twenty languages, including welsh, Chinese, Icelandic, and even Hawaiian. This large booklet aims to tell younger readers some of the facts about the real John Bunyan, and some of the stories from his past. Read about his mistakes and about how he kept being thrown into prison—and how he was determined to tell people about God, no matter what it cost. Alongside the story, which includes several illustrations, there are also some great activities to have fun with. These include: Word-searches to do; Puzzles to work out; Games and activities to enjoy; Things to find out. Treasure that is not jewels, bandits, gold, mysterious writing and dead bodies all wrapped up helps us to understand the world of the Old Testament. Here you can see the fantastic Pharaohs, the horrible pictures of the Assyrians, the elegant drinking vessels of the Persians, and the son of a king who conquered the world. With puzzles to solve, pictures to colour and items to find, this book will give you an understanding about a world that has passed but is living in front of your face! This large booklet aims to tell younger readers some of the facts about the real William Booth. Certain pages from this excellent resource may be photocopied for use as class or group material. Alongside the story, which includes several illustrations, there are also some great activities to have fun with. These include: Word-searches to do; Puzzles to work out; Games and activities to enjoy; Things to find out. Third in a major new series of activity books linked to the Day One Travel Guides. Certain pages from this excellent resource may be photocopied for use as class or group material. Educational and fun activities to be done. ....finally, he was strangled and burnt at the stake! And he knew what lay ahead if he was ever caught. So, what was he doing and why did he risk it? This is the story of one of England’s greatest men who gave us the greatest gift of all... .
People like Wilberforce relied totally on God for strength and courage…. and look what he managed to achieve! Could you be the next William Wilberforce that people are writing about in 150 years time? God can use anyone from any background. William Wilberforce was once just a spoilt rich kid, yet look at what God did in and through his life!. We hope that you enjoy reading it and doing the activities half as much as we did writing it!